In scenes reminiscent of west Belfast in 1969, the PSNI failed to intervene as the defenceless group fled from their attackers. Instead, they encouraged up to 20 Romanian families to leave their houses in nearby Belgravia and Wellesley Avenues and seek shelter in a church hall. The attackers later exulted in the their success, with some travelling to west Belfast where they desecrated republican graves. While the bigots scrawled slogans supporting the neo-nazi group Combat 18 and the fascist British National Party (BNP), links to either group appear superficial. The pogrom in south Belfast is the latest in a recent series of confrontations between loyalist youths and eastern Europeans, which began following a soccer match between Poland and a ‘Northern Ireland’ team several weeks ago. Simmering racial tensions in the area erupted over recent days, culminating in an attack on a rally in support of the east European migrants on Monday night. Youths hurled bottles and made Nazi salutes at those taking part in the anti-racism rally. Earlier, houses inhabited by Romanian families were targeted. A gang smashed windows and threatened to stab pregnant women and children. Other families had been threatened by a man armed with a handgun. The PSNI had taken up to two hours to respond to calls. Some went unanswered. Another Romanian family was attacked on Wednesday night, in the Ballyhackamore area of east Belfast, about three miles from the Village. Mother-of-two Maria Fechete said her family had suffered two weeks of attacks which culminated in racist thugs breaking into her house and threatening her and her children on Tuesday night. She said they were now being forced to flee the country. “We are OK. We are safe here now. But we want to go home [to Romania] because right now we are not safe here,” Ms Fechete said. “I haven’t slept in a week - we’ve just had enough. Children, the youngest a five-day-old baby, have not been spared the ugly scenes of the past fortnight. Couaccusil Filuis told how the attackers had even threatened to kill children. “They made signs like they wanted to cut my brother’s baby’s throat,” he said. The evacuation began when a Romanian family first sought shelter in a house where they thought they would be safe. However, soon there were so many trying to cram in they did not fit and a local church offered them the use of the church hall for as long as they needed. As numbers grew, however, they families had to be bussed to the Ozone Leisure Centre in south Belfast, where the families were housed in a sports hall. 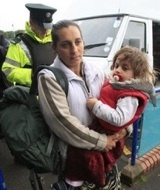 More than 100 Romanians are now in temporary accommodation. They are expected to remain at the secret location for the week. The PSNI were strongly condemned for doing nothing to defend the immigrants, but PSNI Chief Inspector Robert Murdie sought to deflect the blame. “I feel that we all should be ashamed that such attacks are happening, not just in Belfast but right across Northern Ireland,” he said. On Wednesday night, racist and sectarian slogans, along with Combat 18 graffiti was daubed on the Republican Plot in Milltown cemetery. A considerable amount of damage was done to the graves. Sinn Féin Assembly member for West Belfast, Paul Maskey, condemned the unionist response to the latest incidents. “We do not see any flow of information from within that community to the PSNI either on the attack on the Republican graves or indeed more worryingly on the disgraceful attempts to drive the Romanian community from the city. “Racist attacks coming from with the unionist community in Belfast are not new and did not just start this week with attacks on the Romanians,” said Sinn Féin Assembly member for West Belfast Paul Maskey.